Parsley | Become Healthy or Extinct! Parsley is a species of Petroselinum in the family Apiaceae, native to the central Mediterranean region, naturalized elsewhere in Europe, and widely ultivated as a herb, a spice, a garnish and a vegetable. 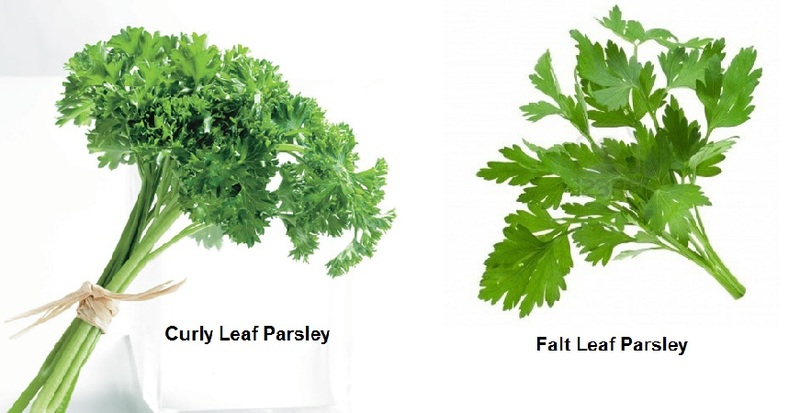 The two main groups of parsley used as herbs are curly leaf (Petroselinum crispum crispu) and Italian, or flat leaf (Petroselinum crispum neapolitanum). Of these, the neapolitanum group more closely resembles the natural wild species. Flat-leaved parsley is preferred by some gardeners as it is easier to cultivate, being more tolerant of both rain and sunshine, while curly leaf parsley is preferred by others because of its more decorative appearance. A third type, sometimes grown in southern Italy, has thick leaf stems resembling celery. Parsley is an excellent of vitamin K and vitamin C, folate, iron, as well as a good source of vitamin A, (notably through its concentration of the pro-vitamin A carotenoid, beta-carotene). Parsley contains two types of unusual components that provide unique health benefits. The first type is volatile oil components myristicin, limonene, eugenol, and alpha-thujene. The second type is flavonoids apiin, apigenin, crisoeriol, and luteolin. Myristicin has been shown to inhibit tumor formation in animal studies, and particularly, tumor formation in the lungs. It has also been shown to activate the enzyme glutathione-S-transferase, which helps attach the molecule glutathione to oxidized molecules that would otherwise do damage in the body. The activity of parsley’s volatile oils qualifies it as a “chemoprotective” food, and in particular, a food that can help neutralize particular types of carcinogens (like the benzopyrenes that are part of cigarette smoke and charcoal grill smoke). The flavonoids in parsley, especially luteolin, have been shown to function as antioxidants that combine with highly reactive oxygen-containing molecules (called oxygen radicals) and help prevent oxygen-based damage to cells. In addition, extracts from parsley have been used in animal studies to help increase the antioxidant capacity of the blood. Besides being used in its dried form as well as fresh leaf form in salads and vegetable dishes, Parsley is often added to fruit or vegetable blends to help heal conditions like anemia, arthritis, gout, blood pressure, kidney disease, piles, skin problems and fever. It is also a blood purifier and detoxification agent and helps with weight loss.